Locations will vary and may be dependent upon weather conditions. Space is limited and registration is required. Please click here to register. 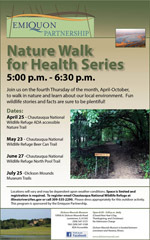 For more information please email Chautauqua National Wildlife Refuge at illinoisriver@fws.gov or call 309-535-2290. Please dress appropriately for this outdoor activity.